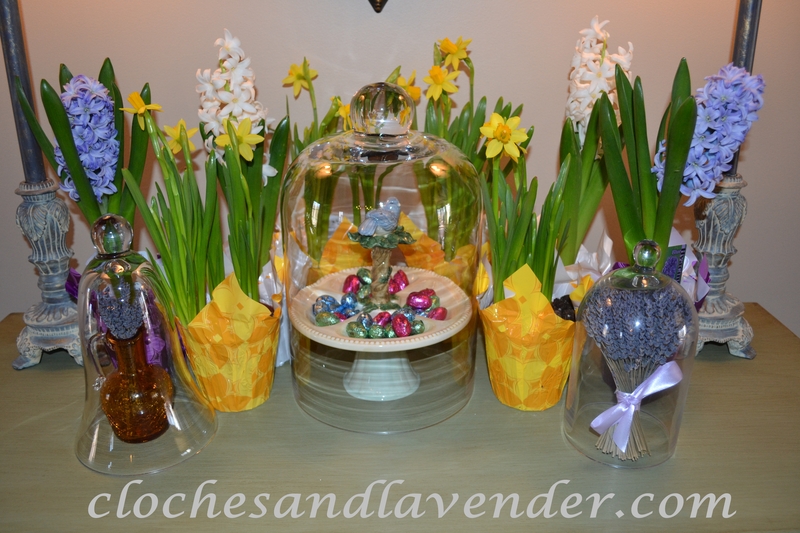 These are some of the cloches in my collection; I wanted to make it as spring like as possible. 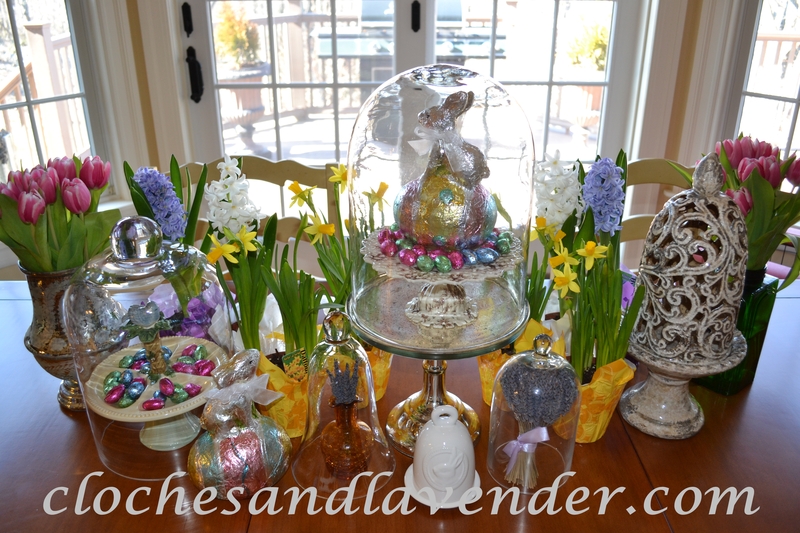 I created two separate vignettes with my cloches, one on the kitchen table and one in the dining room on the buffet. I love my large cloches. The large mercury glass one usually sits on my dining room table and another one was a fabulous find from Home Goods, one of my favorite places to find good deals and nice items for my home. I love all the flowers surrounding them, I wish I could plant the Hyacinths outside but I have to give them away for Easter because the deer eat them like crazy where we live in New Jersey. What pretty displays! Love the spring rabbit! What a great spring display! Your rabbit inside the big cloche is really cute! I like all your flowers- I can’t wait to see mine when spring hits here in northern Michigan. I don’t have any trouble with the deer but I know they like to eat the young plants which ruins them! Thanks for sharing! Thank you very much. The deer are a real problem in New Jersey. thanks for hosting, I had fun. Such beautiful cloches! I love the bunnies sitting on the eggs! Your spring cloches are just gorgeous! I love all the fresh flowers and your bunnies are adorable. A very pretty way to greet spring! Sooo very pretty! Thanx for coming to THT!